Hemistim provides visual stimulation through utilizing color patterns and eye tracking that can be used for specific left or right visual exercise. The stimulus is recognized and interpreted by the contralateral (opposite) occipital lobe. Pursuit and saccadic eye movements are created by targeting on the moving object. 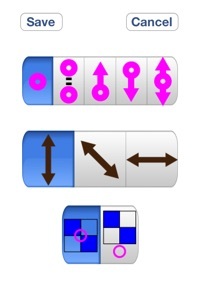 Pursuit away from and saccade towards the alternating squares are initiated by the ipsilateral (same side) parietal and frontal cortex, respectively. This gives the doctor the ability to work the frontal, parietal, occipital, and temporal lobes hemispherically. Pinch/zoom the pattern to change the size of the squares. 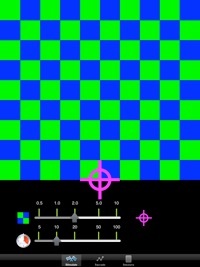 Target motion is controlled by the tapping the small target. This brings up the Stimulation Options panel below. 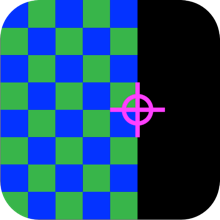 Drag the purple target to set the saccade distance and direction. Switch between saccade, saccade+ pursuit, and pursuit by tapping the screen with two fingers. 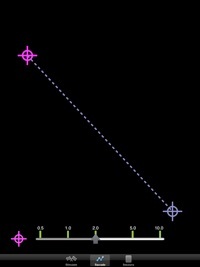 A short dashed line indicates saccade, a long dashed line indicates pursuit+saccade, a solid line pursuit. 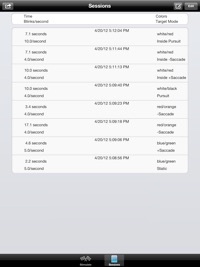 Use the slider to set the speed of the stimulus. Tap the screen once to begin stimulation, double tap to stop. Target Location Options: Over the pattern, below the pattern.